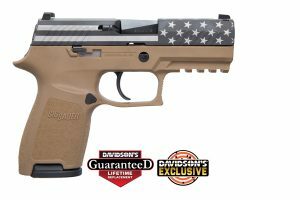 BUY THIS PISTOL BEFORE JUNE 30 2018 AND RECEIVE THREE FREE MAGS FROM SPRINGFIELD! Like its 9mm sibling, the new .45 model sculpts XD-E “point and shoot®” ergonomics into a sleek 1-inch wide polymer frame to eliminate printing, with a 3.3” Melonite-treated barrel for ideal concealability. The Low Effort Slide (L.E.S.) requires 27% less effort to manipulate compared to striker-fired handguns in the same class. Chambering a round has never been easier thanks to the patent-pending hammer design. The result is far fewer slipped pulls, and easier operation for possibly life-saving operation when it counts. Active grip texturing engages every part of the operator’s hand, with three different surface grains to provide secure control of the weapon and a uniquely comfortable fit. For customers who are hesitant to carry a striker-fired pistol in their waistband or handbag, the XD-E offers an undeniable set of safety features that will give new shooters the confidence to carry concealed. 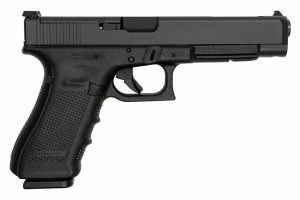 The visible external hammer allows you to both see and feel gun mode for added safety and confidence, and the loaded chamber indicator provides the ability to both see and feel if a round is chambered. The double action trigger has a smooth, yet long and intentional trigger pull giving shooters a sense of comfort while carrying on the go, while the follow up shots from the single action trigger are light, crisp and accurate. An ambidextrous thumb safety/decocker and magazine release is designed for both left and right-handed shooters in mind and various options for mode of carry. Active grip texturing engages every part of the operator’s hand, with three different surface grains to provide secure control of the weapon, and the confidence of a sure grip. 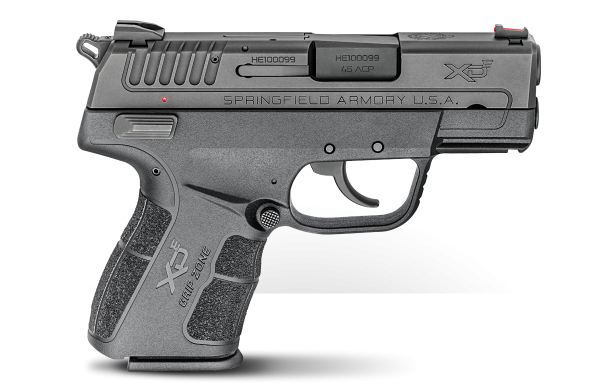 For easy sight acquisition, the XD-E .45 features high quality steel sights right out of the box. The fiber optic front sight paired with a low profile white-dot rear, provides a positive sight picture that’s easily picked up in low light conditions. The serrated rear surfaces help to reduce glare. The 3.3-inch barrel is hammer-forged with a precise 1:16 twist and Melonite treated to match the challenge of constant carry in all conditions. Beneath the barrel, a dual recoil spring system, managed by a full-length guide rod, facilitates steadfast reliability and a soft-shooting feel. 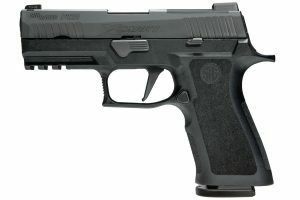 The XD-E .45 ships with a 6-round magazine with “pinky extender” installed, or a 7-round mid magazine with the grip extension, personalizing concealability and capacity. 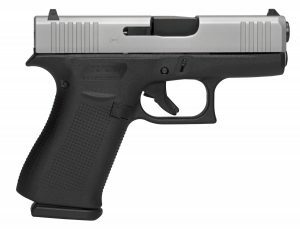 It also ships with an interchangeable flush base plate for maximum concealability. Everything you want in your reliable daily sidearm, now in your first-choice caliber.